I recently joined the BlogHer Book Club, where women bloggers from all over the web read and discuss new releases from Penguin Group USA. 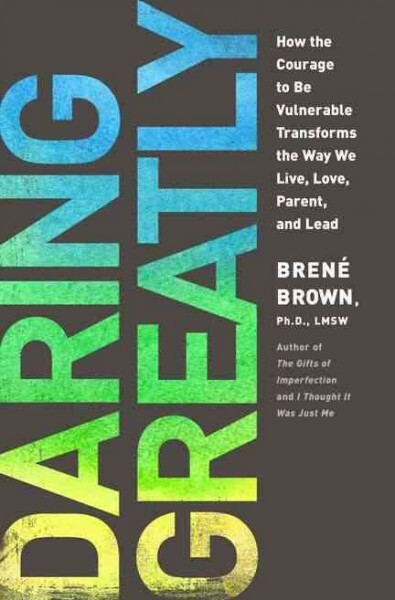 I’ve just finished the book Daring Greatly: How the Courage to Be Vulnerable Transforms the Way We Live, Love, Parent, and Lead by Brené Brown. ‘Daring Greatly’ was released on September 11th and is currently the #1 best-selling self-help book and #24 best-selling book overall on Amazon.com. Brown’s goal in writing this book is to create a national conversation on vulnerability and shame, and she bases this discussion on 12 years of her own research on these subjects. The ultimate goal, according to Brown’s theory, is to move toward Wholehearted living, whereby one must cultivate traits such as authenticity, self-compassion and a resilient spirit, while letting go of what people think, perfectionism and powerlessness. I don’t usually read a lot of self-help books, and at first I had a hard time getting into this book. I thought that, because I’m already a big risk-taker and I’m not really a perfectionist, this book wasn’t for me. I see adults who don’t even look at their waiters when they speak to them. I see parents who let their young children talk down to store clerks. I see people rage and scream at receptionists, then treat bosses/doctors/bankers with the utmost respect. And I see the insidious nature of race, class, and privilege playing out in one of the most historically damaging ways possible—the server/served relationship. Everyone wants to know why customer service has gone to hell in a handbasket. I want to know why customer behavior has gone to hell in a handbasket. This book would be a great read for CEOs, supervisors, educators, parents and anyone in a leadership position (which Brown defines as pretty much everyone). I also recommend reading the Appendix first, because you’ll have an even greater appreciation for the thousands of hours of research that went into creating this book. To join in the Daring Greatly conversation on BlogHer, visit the campaign’s main page. This entry was posted in Movie Reviews/Book Reviews and tagged book clubs, book reviews, community, non-fiction, research, self-help books, shame, vulnerability. Bookmark the permalink.